Essential Fatty Acids (EFA's) are a health requirement of every man, woman and child. Every cell in our body needs them to be able to function. They cannot be made in the body, and must be obtained from the diet or supplements. Udo's Choice was developed by Dr Udo Erasmus, one of the world's leading experts on dietary fats. It is a carefully balanced blend of unrefined organic seed oils along with other nutrients vital for good health. And since Udo's Choice is a food made only from plant sources, it is ideal for vegetarians and vegans who can't eat fish. 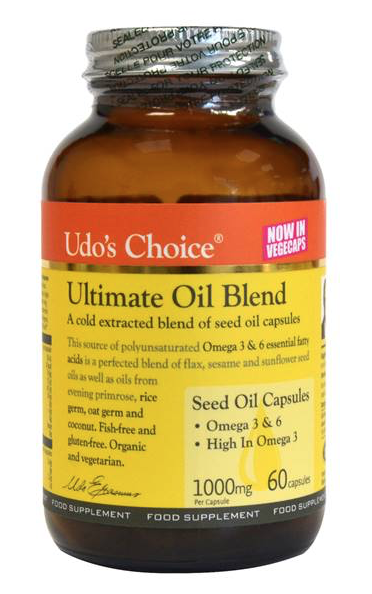 Udo's Choice Ultimate 3, 6, 9 Oil Blend is a certified organic blend of guaranteed GMO-free, unrefined edible oils. This unique blend delivers a reliable source of the omega 3 (n-3)and omega 6 (n-6) essential fatty acids that are essential to life. Carefully chosen, the seeds used to make Udo's Choice Ultimate 3, 6, 9 Oil Blend are pressed at a temperature of less than 120°F (or 50°C) and, even more important, in the absence of light and oxygen. Nitrogen-flushed, amber glass bottles packaged in a box and found only in the fridge or freezer, protects this Oil Blend from potential damage by heat, light and oxygen, and helps to ensure maximum freshness and stability. 1 to 5 tablespoons per day of Udo's Choice 3, 6, 9 Oil Blend will usually make skin soft and velvety. For serious conditions, seek advice of a nutritionally trained health care professional. Udo's Choice Oil Blend can be used with cold, warm, and hot (once off the heat source) foods but must not be used for frying, baking, or other high temperature cooking. The oil can be used in salad dressings, soups, on steamed vegetables, in protein shakes, yoghurt or in juices. Pour over rice or pasta. Do not exceed Nutritional Supplement Recommended Intake. Consult with a medical doctor if on anti-coagulent medication.